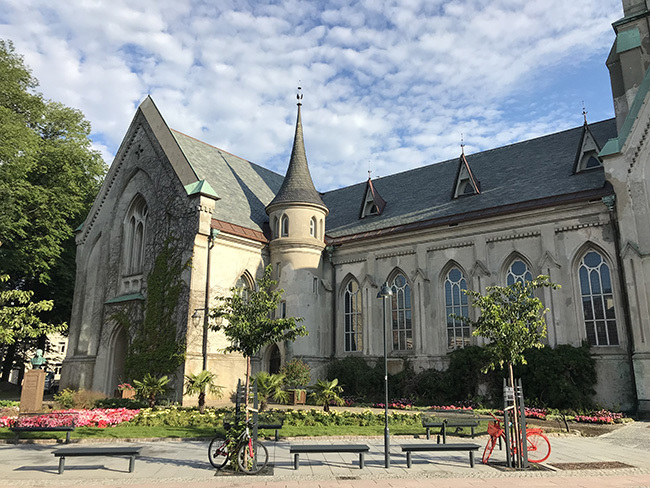 Kristiansand Cathedral is one of Norway’s biggest. Aside from cruise ship calls at Kristiansand, very few international tourists experience the Norwegian summer along Norway’s southern coast. That’s a crying shame, as each time I’ve been to the region it has felt more like Spain than Scandinavia! Despite being the country’s fifth-largest city, Kristiansand remains off-the-radar for many independent travelers. It’s super easy to get to by train from Oslo, or by plane (from Oslo, Bergen, and Trondheim), and there’s even a direct flight from the UK. The city center—also known as Kvadraturen—is compact and surprisingly easy to get around thanks to its grid layout. You’ll be instantly drawn to the waterfront, which is on three sides of the district. A blue flag beach is the surprising highlight of the promenade. While the coastline is attractive, the entire downtown area is nice to stroll around. A large neo-Gothic cathedral stands proudly on the city square, roughly at the center of the Kvadraturen district. It can comfortably seat 1,000 people, making it one of the largest religious buildings in Norway. There’s also the old town known as Posebyen, a collection of pristine white buildings well worth a wander around. The occasional weekend market brings the area to life. Of course, this wouldn’t be a Norwegian city without easy access to nature, and as such, there are two recreation areas within walking distance. The forested island Odderøya is linked to the downtown by the modern Fiskebrygga wharf, which buzzes with people whenever the sun is out. Odderøya itself is roughly the size of the city center, and is home to walking trails, rocky beaches, a lighthouse, and wildlife including roe deer. At the other end of downtown, the forest and lakes of Baneheia will leave you forgetting all about the city below. The approach is steep, but once you’re up, there are many miles of trails to explore. Last but definitely not least, if you’re traveling with kids and they get bored of the beach, don’t miss Dyreparken. Located a few miles east of the city, it’s a theme park, zoo, and water park all rolled into one. Although the theme park characters are all Norwegian family favorites, non-Norwegian children will enjoy it nevertheless. Some of the white wooden homes of Flekke­fjord’s Dutch Quarter. Best known for its gorgeous Dutch Quarter, Flekkefjord is less than two hours by bus from Kristiansand. The town had a strong trading relationship with the Netherlands in the 1500s and 1600s. Stone and wood went south, while silver, grains, porcelain, silk, liquor, and tobacco were all welcomed in exchange. The area of the town in which many of the traders lived has been beautifully preserved, and information boards detail the history of what took place on individual streets. Just remember that every house is still lived in, so don’t peer too closely into the windows! If you’ve got four hours to spare, take a ride on the Flekkefjord railroad for a truly unique experience. As the spur line has been closed for nearly 30 years, there aren’t any trains. Instead, visitors ride special tandem rail bikes made for two adults plus up to two children. The area west of Flekkefjord is one of 140 UNESCO Global Geoparks, areas of geological importance. The rock type anorthosite—formed from molten rock hundreds of millions of years ago—is common throughout the area, but is relatively rare elsewhere. The park consists of many locations of interest. Close to Flekkefjord are the 1,000-year-old Li gård farmstead and the beautiful caves and potholes at Brufjell, fast becoming a must-visit site for Instagrammers and YouTubers. Looking the other way from Kristiansand up toward the start of the Oslo­fjord, small towns, villages, and many islands dot this stretch of coastline that has become known as the Norwegian Riviera. There is Lillesand, a smaller version of Kristiansand that is popular with Norwegians during the summer. A sightseeing trip around the Blindleia islands is highly recommended. Then there’s Grimstad, birthplace of the popular Nøgne Ø brewery and home to many summer festivals. Much of the fishing village heritage of Risør has been preserved, including several old sailing ships. Such is the importance of boating to the town, there’s even a Wooden Boat Festival held every year. 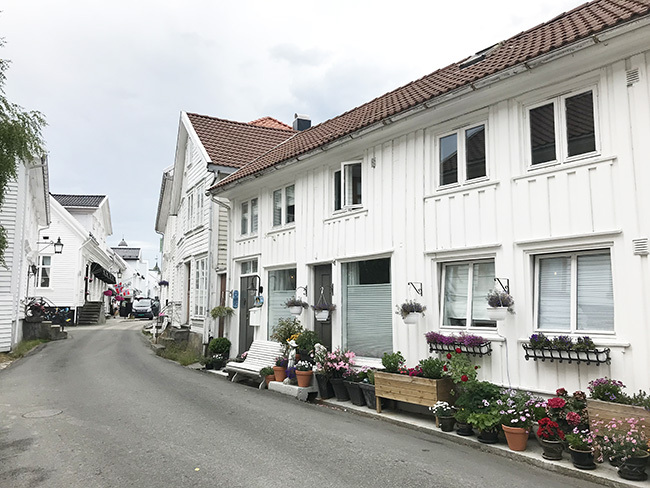 Tvedestrand is best known for its range of new and antique bookstores, while Arendal has the charm of Tyholmen, a trading district dating back to the 17th century. Although I don’t necessarily recommend a tour of the south for a first-time visit, those planning a return trip will see a different side of Norway, away from the masses. If you’ve done the fjords and seen the big cities, take a look south. You may be surprised at what you find. This article originally appeared in the August 24, 2018, issue of The Norwegian American. To subscribe, visit SUBSCRIBE or call us at (206) 784-4617.